In this post I’m going to talk about vertical fractures regarding a case I had a few months ago, the one on the right picture. This maxillary first premolar was ready to get a root canal therapy but presented a mesiodistally vertical coronal fracture that continued to the furca which divided the tooth in two roots, bucal and palatal. The tooth had an old restoration on the distal side that was not in occlusion and that probably let the fracture appear on the mesial area where you can see the line fracture. The tooth was also sensitive to vertical percussion and had some mobility, however, there wasn’t significant evidence or bone loss on the radiographic tests. 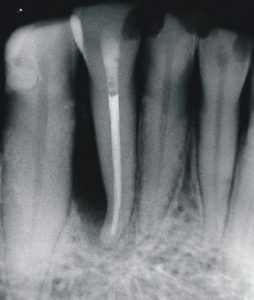 Most of the vertical fractures are due to excessive concentration of loading over some areas of the root canal. 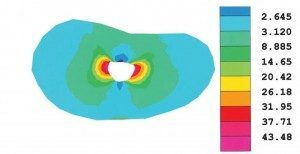 Studies have shown that the curvature of the root canal seems more important than the external morphology of the root, in terms of stress concentration, the remaining thin dentin increases the magnitude but not the direction of the stress generated by forces. 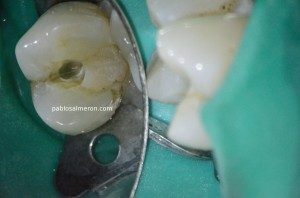 In fact as thinner the mesiodistal dentin walls are, the concentration of forces on the lingual and bucal walls increase the risk of fracture in this direction contrary to what one might think at first, more dentin thickness the harder it is to break in that direction, well… it is not like that. There are three factors that determine the distribution and direction of forces, a) the anatomy of the root canal, b) the anatomy of the root, c) the thickness of the dentin. The canal anatomy seems to be the most important factor determining the distribution of forces. The vertical fractures most often occur in premolars, both maxillary and mandibular, followed by fractures on the mesial root of mandibular molars and central incisors. One of the biggest problems we find in cases of vertical fractures is that they aren’t easy to diagnose. Most symptoms usually appear years after the fracture. We may well find, sensitivity to percussion and vertical palpation, presence of fistula, or a large and isolated periodontal pocket that doesn’t correspond to a general periodontitis. Radiologically we can observe a radiolucent area with horizontal bone loss along the affected root. Diagnosis vertical fractures is a challenge for the dentist because the symptoms are similar to a failed root canal treatment and usually radiographic test doesn’t show evidence of a fracture clearly. 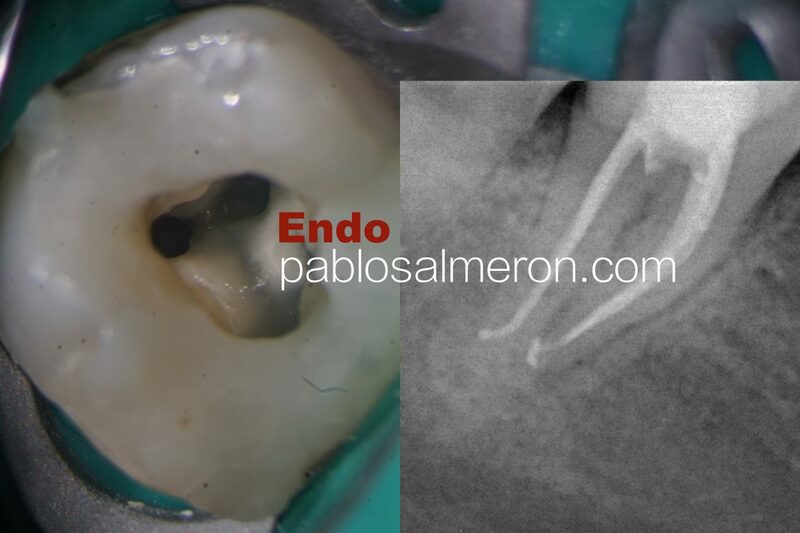 Another problem in endodontically treated teeth is often the filling materials doesn’t allow us to see the fracture line on the radiograph as they’re in the same plane. Patients may experience anxiety to thinking that the endodontic treatment is not working when, in fact, the problem is a fracture prior or post to the root canal treatment. I would like to introduce you this course I teach about the use of the microscope in your own practice. This course is recommended for those dentist who own a microscope (the brand doesn’t matter) and want to improve their technical skills with it. 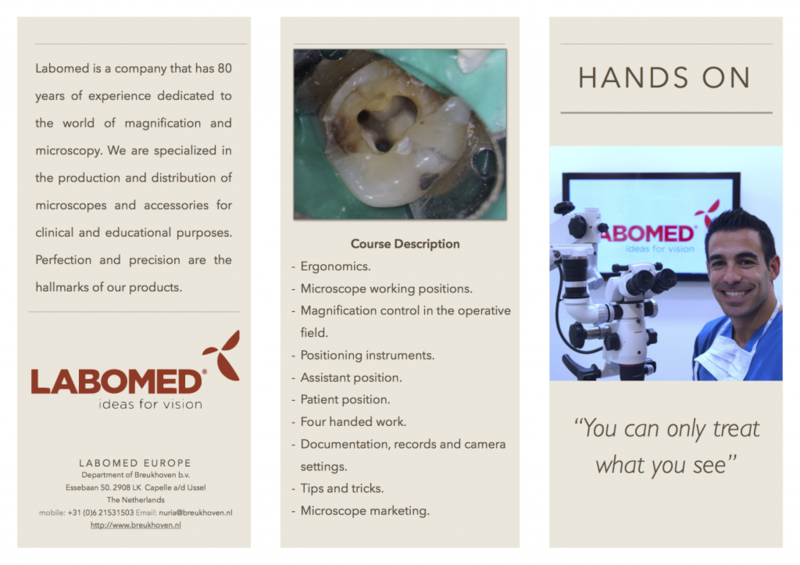 The course takes place in your own practice with your own team and assistants, in your own space and with your own patients, so you will be able to maximize the use of the microscope making a pleasant working experience. The course can take place in UK or in any other country. 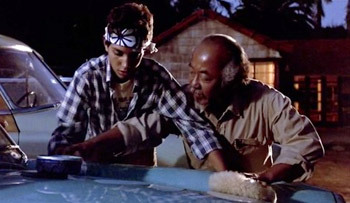 You can only treat what you see. 90 degrees roots. Root canal treatment. 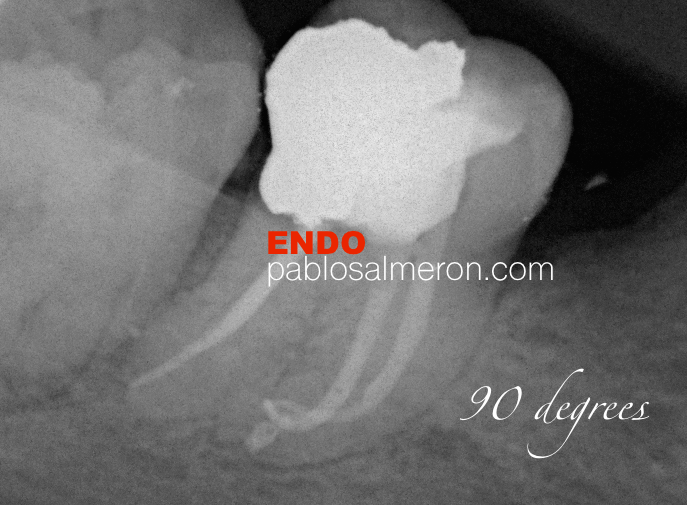 – Second lower molar with 90 degrees twisted roots. – MTwo + Reciproc files. A second palatal canal or a centred MB2? Successful root canal therapy requires an excellent knowledge of both the external and internal anatomy of root and its canal morphology. 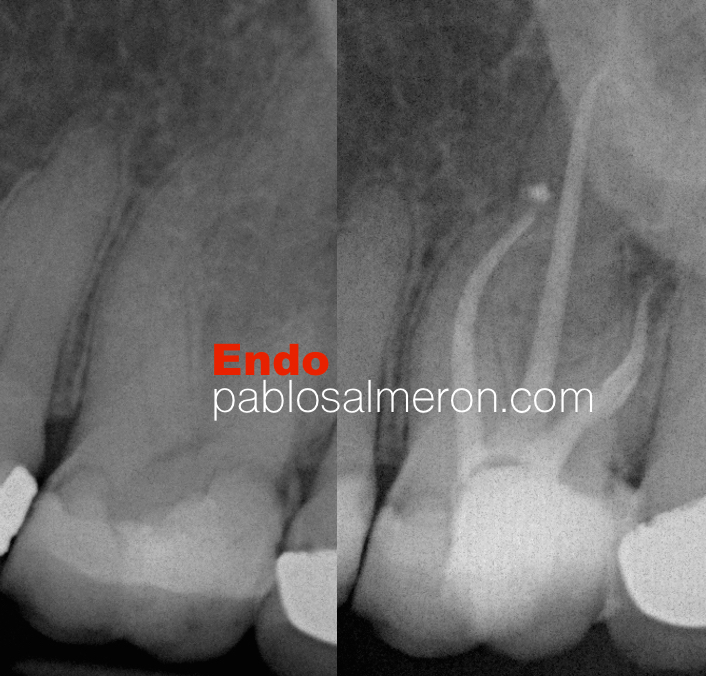 Extra roots or root canals, if not detected, are a major reason for endodontic failure. Maxillary molars show considerable anatomic variation and abnormalities with respect to the number of roots and root canals. Traditionally, the maxillary second molar has been described to have 3 roots with 3 or 4 root canals, with the fourth canal commonly being found in the mesiobuccal root (MB2). Several authors have reported of maxillary second molars presenting with 4 roots with the accessory root being the second palatal. In this case, an upper second molar, I found a 4th canal in an unsual location. A second palatal canal or a centred MB2? Watch it in HD 1080p. 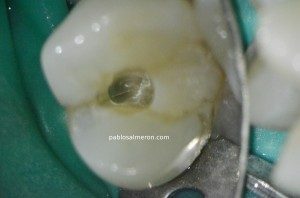 – Second upper molar with an unusual 4th canal. Root canal treatment, first upper molar. – First upper molar root canal treatment. Root canal treatment. Second molar. Endodontist. – Lower second molar root canal treatment.